With over two decades of childcare services in NYC, and after the success in opening their most recent downtown location All My Children Day Care opens their 15th location to welcome children into a safe, eco-friendly, and state-of-the-art facility with a warm, professional staff. Parents to children under 5 years old in the UWS of New York City are welcome to meet the dynamic director and tour the newly renovated facilities, allmychildrendaycare.com/uws. Open House Sunday, July 31st! From 11AM to 3PM. Following their Tag Line, "Every Child is a World," AMC was the first in NYC to promote an Eco-Friendly Day Care to help children adapt to a caring and loving atmosphere. At All My Children, youngsters are carefully prepared for school and life readiness. The safe, nurturing, green learning environment and ethical character define AMC's dedication to instill skills into children to help them create a better future. AMC centers utilize The Creative Curriculum, Common Core standards, as well as Music, Movement, Drama, and Nature programs. The daycare and school focuses on children’s logical thinking and speech development. Children’s cognitive skills will be sharpened by a special program for Young Chess Players (introduction level). To meet the needs and interests of the community, AMC will optionally open a Gifted and Talented Test Preparation Program, Emergent Second Languages and Foreign Music class (upon demand). Thanks to parents and children who have benefited from the other All My Children locations, a new center was born out of demand for a new school in the area. 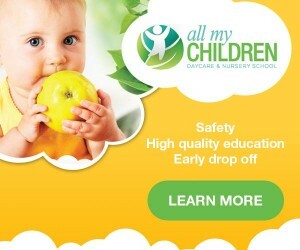 All My Children Daycare is proud to announce the opening of its 15th location on NYC's Upper West Side at 101 W. 85th St. The center will offer programs for children under 5 years of age at the state-of-the-art, eco-friendly facility. The center offers a professional staff, a quality education, childcare, hot meals, year-round programming, and much more. An open house is scheduled for parents and children to come to see the new All My Children Daycare center on Sunday July 31st from 11am-3pm. Meet the director and learn about the daycare's creative curriculum. There will be free crafts for kids and tours for the families. With over 2 decades of experience, AMC is a premiere daycare for New York City's youth. AMC is here to offer a holistic approach to education inspired by nature. AMC not only educates the children of today, but cultivates the leaders of tomorrow. By providing children with a nurturing and responsive environment to discover, learn, grow, and realize their potential, children are empowered with school and life readiness skills. Our children can lead the way towards a better tomorrow.